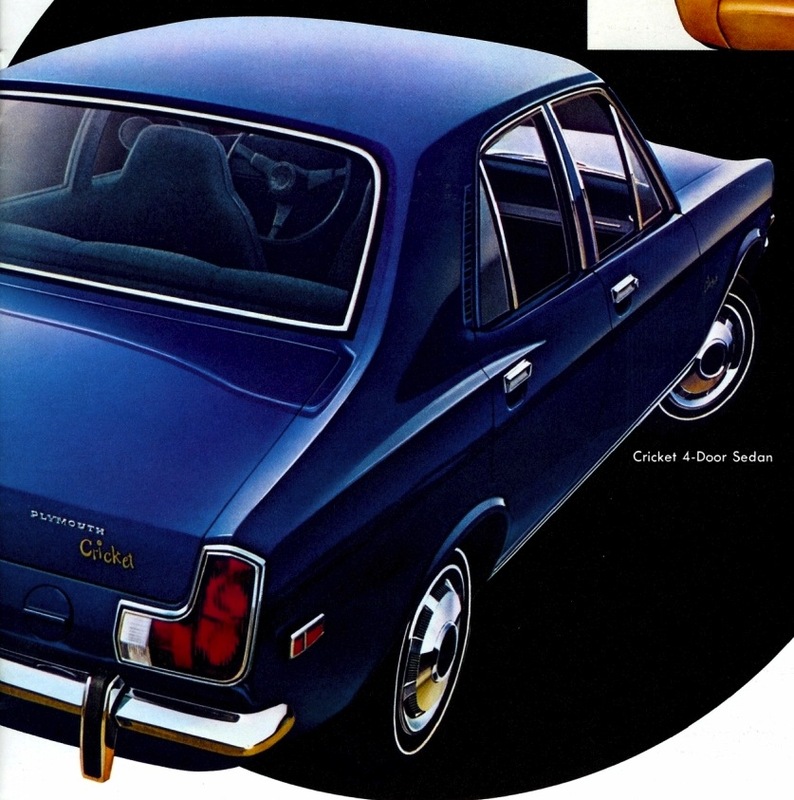 The 1971 Plymouth Cricket four-door sedan weighed in at 890.4 kilos (1,963 pounds) and carried a base price of $2,115 before taxes. The North American small car wars waned throughout the 1960s as domestic compacts grew larger and heavier with each passing season. Pint-sized vehicles were still offered by the Big Four automakers but they were all captive imports, sourced from abroad. 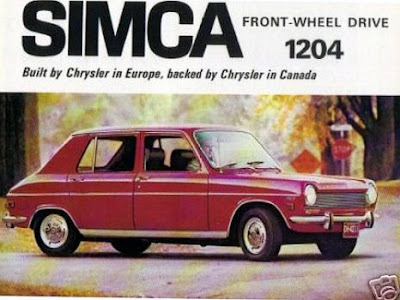 At Chrysler Canada, that showroom-floor offering since 1959 had been the ‘imported from Paris’, Simca. This 1963 black four-door sedan was the first Volvo Canadian to roll out of the factory in Nova Scotia. The war quickly heated up at the end of the 1960s. Volkswagen had long led the way with its durable Beetle. 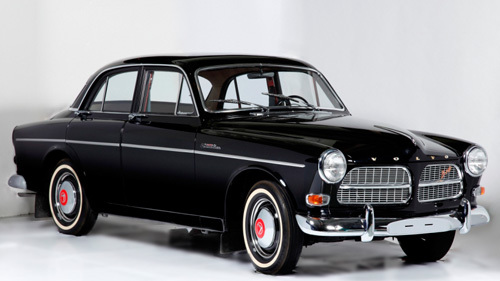 Volvo was quick to set up an assembly plant in Dartmouth, Nova Scotia. Subcompacts from Japan were gaining in popularity with Canadians. 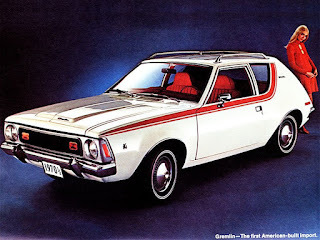 1970 1/2 Gremlin from AMC. North American manufacturers found themselves playing catch up. American Motors was first to market when it introduced its adorable Gremlin on April Fool’s Day, 1970. Ford’s Pinto and Chev’s Vega arrived hard on Gremlin’s heels for the 1971 model year. While the trio was designed and built in North America, for backup, GM Canada continued to ship to our shores the strong-selling Vauxhall from its British subsidiary for Pontiac-Buick dealers and rebadged it as the Envoy for Chev-Olds dealers. 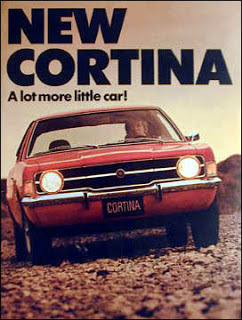 The second line of defense from Oakville, Ontario should have been the highly popular Ford Cortina, also sourced from the UK. 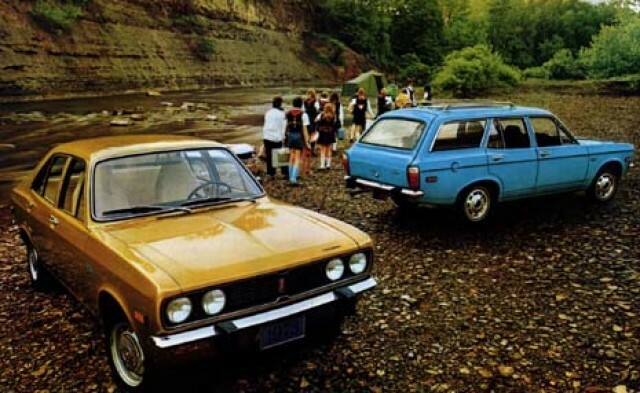 Not a single one was sold in Canada during the 1971 model year because of labour problems. It made a belated appearance on August 6, 1972. American Motors abandoned the subcompact market completely in 1962 when it dropped the Metropolitan, sourced from Austin. For round two of the tiny transportation battle, Chrysler took a different tack from its competitors because there were no plans to develop a domestic subcompact. Corporate thinking was that there was no need, since Chrysler owned a number of international operations and could draw on them to fill that market segment. The ChryCo dealer body still fielded the French-built Simca to the faithful but it was no longer a popular seller and added little to the profit margin. 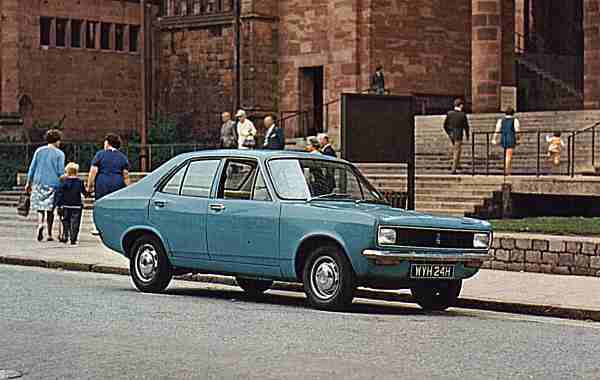 1971 Hillman Avenger used halogen headlights in the British market. Designers gave the Avenger the latest styling. The 2 286-millimetre (90-inch) wheelbase carried a gently rounded, unitized-body envelope incorporating the trendy Coke-bottle swell at the rear, mated to a long hood. Flanks were accented with a full-length, sharp razor crease immediately below the safety-recessed door handles. The car was easily distinguishable from others in its class with its unique, bold hockey stick taillights. The instrument panel for the Plymouth Cricket was no-nonsense and strictly European in its layout. The padded instrument panel was very European in flavour, with light and wiper controls mounted on the steering column. The two-speed heater/defroster was located front and centre, above the radio. The Hillman Avenger was assembled in Argentina and sold as the Dodge 1500. The pert little vehicle had already been modified to left-hand drive for the European and South American markets. It had been road tested for more than 1.6-million kilometres. For introduction to the Canadian market, there was little to do but ensure that the car to meet the federal Ministry of Transport standards. To that end, side markers were affixed to the front and rear fenders, quad headlamps kissed the horizontal, blackout grille. Inside, ‘tombstone’ headrests were moulded into the front, bucket seats, stealing a page from AMC’s sporty Javelin. The engine chosen for the Canadian market was the 1.5-litre (91-cubic inch) four-cylinder, 5-main bearing high cam mill. 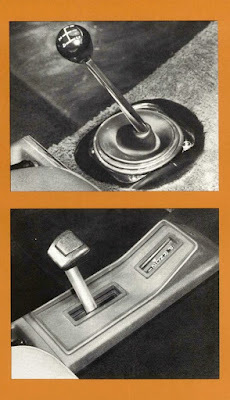 It worked in tandem with the fully-synchronized, four-on-the-floor, short-throw manual transmission. For an extra $228, one could zip around courtesy of Borg-Warner’s three-speed, automatic transmission, with the lever mounted in the centre console. 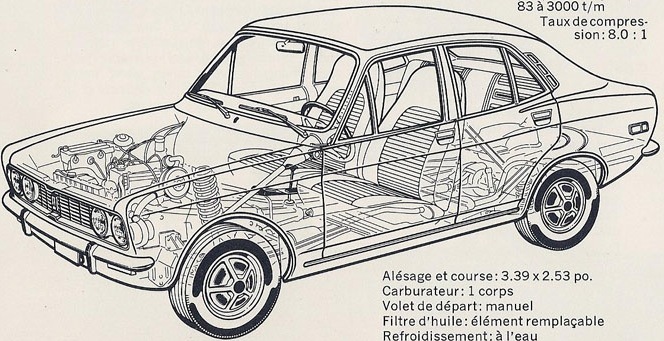 Schematic details the Cricket’s three-box, unit-body construction. Standard equipment was impressive. Rack and pinion steering, power front disc brakes, coil springs and an anti-sway bar set the Cricket apart from many of the others in the subcompact herd. Popular options included an AM push-button radio for $85; white sidewalls for the standard radial ply tires cost $35. Air conditioning was offered and those who did were required to a $100 luxury tax to the federal government. Stylists gave the Plymouth Cricket hockey stick taillights. For $100 one could deck out a Cricket with the Décor Package upgrade. That included dual horns, a glove box light and lock, a cigar light, gauges for oil pressure and the alternator, front door storage pockets, a day/night adjustable mirror, deluxe carpeting, brightwork moulding around the windows, dual paint stripes on the sides, bumper guards, deluxe carpeting and wheel covers, courtesy lights, an upholstery upgrade and an instrument panel light controlled by a rheostat. Crickets hopped out of the factory in Ryton-on-Dunsmore, England clad in “happy colours”. Exterior hues that made the Cricket cut were Polar White, Firebrand Red and Oasis Green. Then there were the metallic finishes comprised of Sunset, Tangerine, Aztec Gold, Electric Blue and Golden Olive. Regardless of finish, each body went through a seven-step, dip-and-spray rust protection process, designed to thwart the twin curses of the Canadian highway—corrosion and rust. Five could be seated in comfort--according to sales hype. Cabin colours selected for the tough-wear vinyl upholstery were Black, Vellum, Tan, Olive and Blue. The boys at Plymouth were given the task of colour-coordinating exteriors with interiors for maximum good taste. 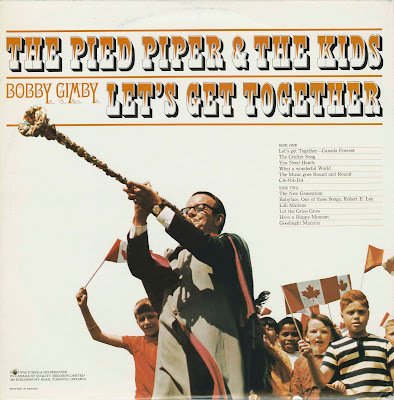 In Canada, the marketing boys opted to forgo the cartoon cricket used in the States and hired orchestra leader and CBC-Television star, Bobby Gimby, the Pied Piper of Canada, to ‘blow his horn’ for Plymouth. Bobby and his trumpet did the job proudly, in both official languages. 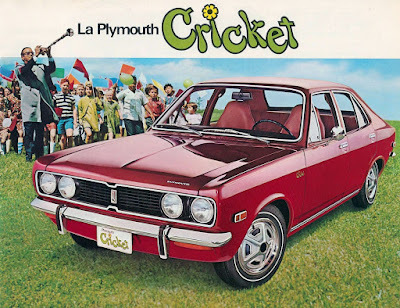 While Plymouth’s Cricket never sold in big numbers, records show that in the 1971 calendar year, 2,995 of them chirped their way home to consumers. It brought up the rear of Plymouth dealers’ sales. Cricket ranked 49th in domestic registrations, behind the Chrysler New Yorker and ahead of the Dodge Colt in nameplate sales pie. 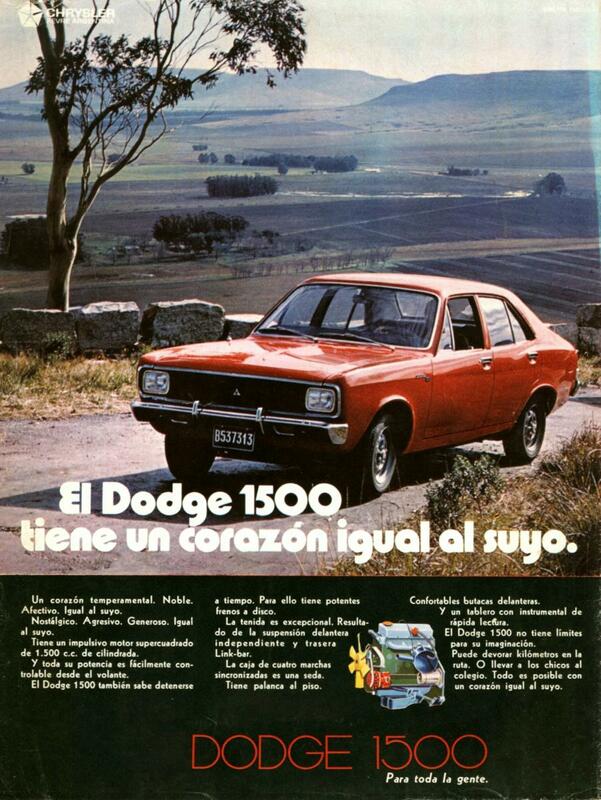 The price for the four-door sedan rose to $2,324 for 1972 and the wagon was introduced at $2,737. 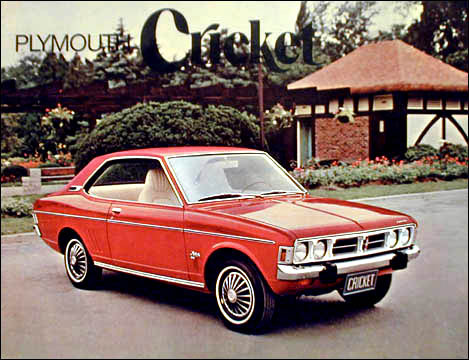 New car registrations for 1972 show that number of Cricket dropped to 51st place as only 2,480 sets of taillights zipped out the dealers’ doors. Canadians passed by the imports and bought more North American-built cars than ever before. The British auto industry found itself in deep trouble at the beginning of the 1970s. 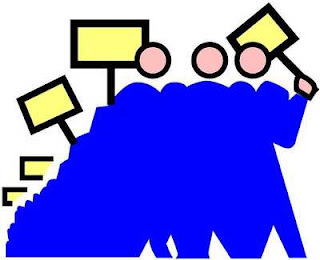 Union and management clashed, resulting in severely compromised product quality. 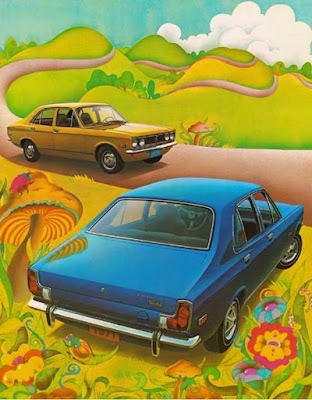 Whether it was the Austin Marina or Ford Cortina, many of the vehicles shipped to Canada from the UK arrived with major defects. 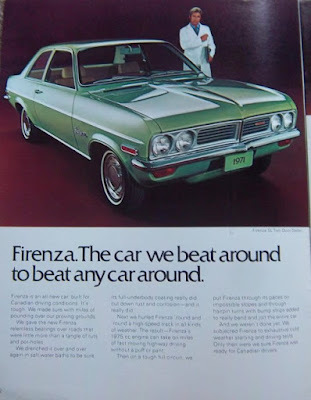 The Firenza from Vauxhall was so shoddily built that angry owners sued GM Canada in the nation’s first-ever class action suit. Sadly, Cricket suffered the same shameful indignities as its other British counterparts and was withdrawn from the Canadian market in mid 1973. Copyright James C. Mays 2015 All rights reserved.